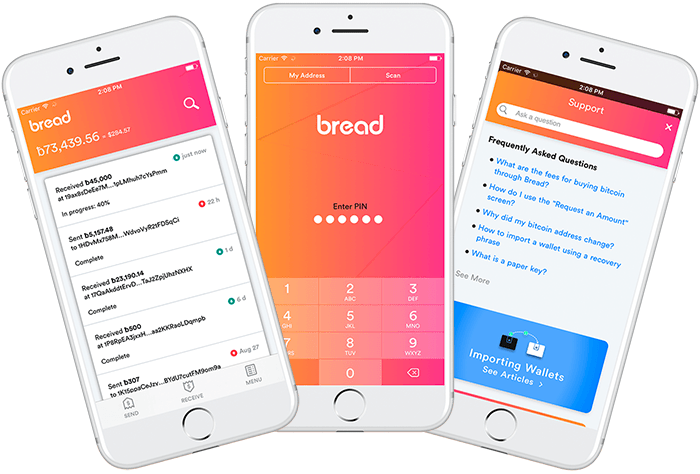 Breadwallet was the first standalone bitcoin wallet to be added to Apple’s App Store, is the No. 1 decentralized bitcoin wallet by downloads today, and has earned a reputation of providing uncompromising security, privacy, and ease of use. Using bitcoin doesn’t have to be complicated, and we strive to provide a user experience that makes it easy for any new user to jump in and get started. The cryptocurrency landscape has evolved considerably since we first launched three years ago. We have been busy preparing to support a user base that is increasingly interested in a wider range of services than simply sending and receiving bitcoin. In the coming months, we will be adding more financial services in a range of geographies, as well as support for more crypto assets that complement bitcoin. These are only the first steps towards building a powerful financial platform that can be used around the globe. Breadwallet is becoming more than just a wallet, and to reflect that we are dropping “wallet” from our name. Breadwallet is now simply Bread. Today we are launching a brand new iOS app, rebuilt from scratch, with a new look and added features. The Android version is close to completion and will be available soon. The new design is optimized to be even better for new users, making it easy to discover useful features and to more quickly understand how bitcoin works. Most screens feature a help icon in the top right that will allow users to see an explanation of the screen they are looking at with a single tap, and just as quickly let them return to where they left off. And for experienced users, advanced features are now more easily accessible without complicating the interface. This is all a result of listening to user feedback and ensuring that commonly-used flows are simple and intuitive. Our more advanced users will be happy to learn that we have added the ability to display your bitcoin balance both in bits as well as full bitcoins, and network transaction fees can now be modified to be either fast or cheap, depending on your needs. Another popular new feature is the ability to save a memo together with every transaction you send or receive, so you can note specific details for later reference. Although these memos are not saved on the bitcoin network, they will remain in your Bread even if you restore your wallet when replacing your phone. Our focus has always been on the security and privacy of our users, while keeping the user experience as simple as possible. We have maintained this commitment as we add new features and expand the Bread platform to offer additional banking, financial, and cryptocurrency-related services to our users around the world. If you are an existing Bread user, we hope you’ll love the new design and features we have prepared for you. And if you have not yet used Bread, we are excited to have you try the Bread experience by visiting breadapp.com or searching for Bread in the Apple App Store. We know you’ll like what you see.